Mogu Mogu Boom Boom Cap Promo ~ Philippine Freebies, Promos, Contests and MORE! 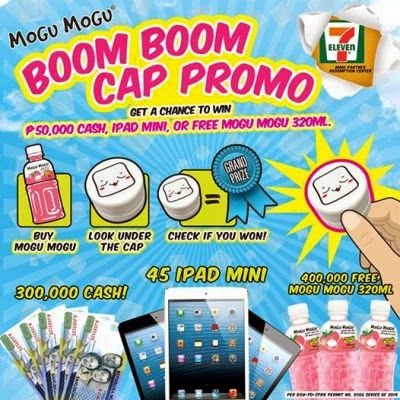 Get a chance to win cash, gadget, or bottled drinks in Mogu Mogu's Boom Boom Cap promo. Joining is very easy. Just buy any 320ml or 1,000ml variant of Mogu Mogu, any flavor will do. Look under the cap for any prize you may have won. For winners of Mogu Mogu drink, surrender your winning cap at any 7-Eleven branch to claim your prize. For winners of cash and gadget, call the Mogu Mogu office to get the details.Six winners will take home P50,000 each. Not only that. Forty-five winners will also receive iPad mini 16 GB each. And around 400,000 bottles of FREE Mogu Mogu 320ml will be up for grabs. What are you waiting for. Purchase as many participating Mogu Mogu drinks as possible for more chances of winning.